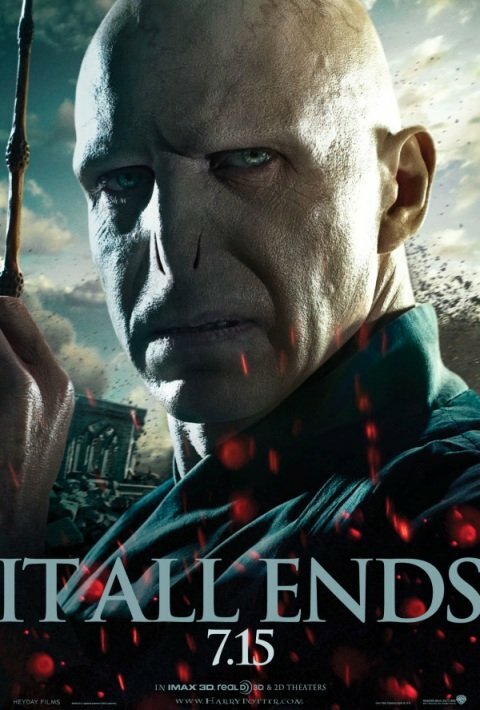 To go with the hero posters that have been released all week for Harry Potter and the Deathly Hallows: Part 2 (you can catch up on all of them here), the evil and noseless Voldemort is taking the center of his own poster today. It's the same format as all of the other character posters-- intense close-up, flying orange sparks, the tagline "It All Ends"-- but this is probably the only one that will cause children to spontaneously cry when they see it in a movie theater. Hey, who says that's a bad thing? Check out the poster below for what might be a closer look at the Dark Lord than you ever wanted. Harry Potter and the Deathly Hallows: Part 2, as you probably know by now, comes to theaters on July 15. Start stocking up on your tissues and commemorative wands now, because it's definitely going to be the summer of crying over Harry and company.